Today we are covering Drone videography from all sides with four fantastic guests starting with Jos Stiglingh the creator of the mega-viral video “Fireworks filmed with a drone”. Then we are joined by two lawyers, Matt Saunders, a copyright attorney who discusses the legality of drones and the copyright issues that go with it and Jonathan Rupprecht, an attorney, commercial pilot and unmanned aircraft consultant that discusses the current FAA regulations. And finally, we invite Paul Antico, film maker and drone enthusiast, to talk about how he captures, grades and edits footage shot with a Go Pro and the DJI Phantom. Jos Stiglingh becomes the new face of Drone viral videography with his Fireworks Filmed with a Drone and we have him on the show to talk about it. 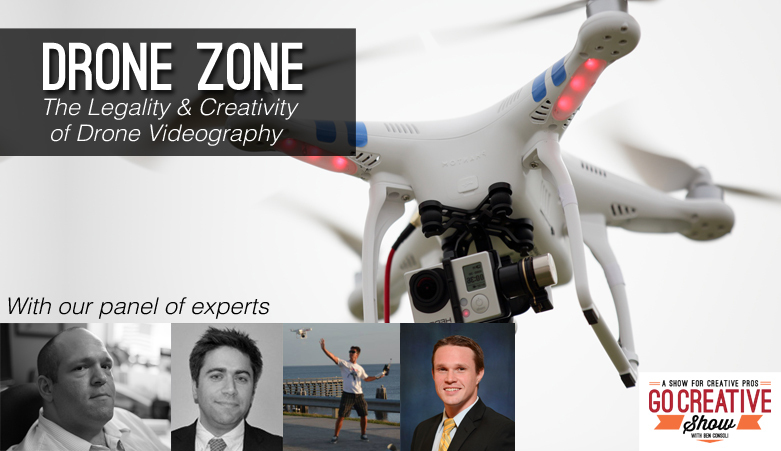 I sit down with 3 amazing guests discussing all aspects of drone videography. Matt Saunders is an attorney at Saunders & Silverstein LLP in Amesbury, Massachusetts. He practices in matters of trademark, copyright, Internet, and software law. We have matt on the show today discuss the legality of drones and the copyright laws associated with the footage. Jonathan is a criminal defense attorney at the Law Offices of Roger P Foley in West Palm Beach. He is a commercial pilot and unmanned aircraft consultant and has a unique perspective on the current FAA regulations. And finally, we invite Paul Antico, film maker and drone enthusiast, to talk about how he captures, grades and edits footage shot with a Go Pro and the DJI Phantom. Is it legal to shoot video with your drone? Can you sell your drone footage? Model aircraft enthusiasts should read this. Phantom in the Sky from Anticipate Media on Vimeo.